On Trees, Swallows, Houses, Maps & Atlases’ terrific 2006 EP, the group does an amazing job of articulating what kind of band they want to be. With stunning precision and electricity, the Chicago group created a marvelously listenable piece of math-rock. Flash-forward to 2012. 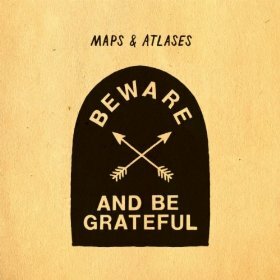 Maps & Atlases releases Beware and Be Grateful, their second LP. Gone are the electrifying drums. Gone are the wildly complex guitars. Gone is the apparent fun frontman Dave Davison used to have behind the microphone. On the album, Davison sings pop melodies, actively repressing his distinctive vocal ticks. Master drummer Chris Hainey may as well not even be on the record- the drums here sound like demonstration loops on consumer-grade synthesizers. The guitars sound closer to Vampire Weekend than Hella. If Davison and crew are hunting for radio play, they will be thoroughly disappointed. Even when they shy away from the experimental sound that made them listenable on Trees, Swallows, Houses, they don’t have the chops to make a good pop record. Beware and Be Grateful is them not trying; The second half of “Old Ash” is two minutes of a repeated guitar riff.